Synchronize your Tamagotchi clocks, kids. 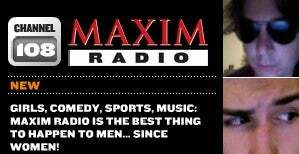 Today's the first show in Spinelli's new Sirius satellite radio show, RPM, which he'll be hosting with Maxim's zany-brainy Jon Wilde. It'll be a supercharged hour of extreme machines and the hottest hoo-ha! Yes! Grrrr! show about cars and related conveyances. Today's guest will be Michael Locke, CEO of Ducati. Leave your questions in the comments.